You know how I love coffee? You can say MIMOSAS and Danetha will be right over. She shares so much good stuff in this episode, but I think my favorite part was her $800 confession. I loved it so much so that I dug a little deeper into this at the end of the episode! What was your favorite part of this episode? Be sure to share your thoughts in the comments below! [0:00:27] JH: Hey, hey, hey, this is Jen Hemphill. Welcome to yet another episode. I appreciate you tuning in and I have to tell you, it’s yet another fabulous day here. It is sunny outside as I’m recording this and I love the sun and I have yet another great guest to introduce to you. So that’s a very exciting but before I do that, I’m going to digress from today’s show just for a moment because I feel it’s really, really important as I’ve had this reminder, this experience this week. That’s just to tell you to take some time for you to take a break. This past week, I’ve been feeling for a lack of better word, “blah” and I realized that it was just a reminder for me to slow down. Sometimes, I get excited about things. Okay, a lot of time, I get excited about things and I literary just go, go, go then what happens, I don’t take time to really just breathe and just relax and really fully just take a moment to recover, to recoup if you will. So therefore when I don’t do that, then it goes into having some unproductive days, which leads to me being frustrated because I like to have productive days and then from there, it stems — you know that domino effect where I don’t eat well which makes me feel even worse. So if you have those moments which I’m sure I’m not the only one and maybe this also serves as a reminder for you just to step away for a moment, breathe, take a break and maybe take some time to really fully refresh, to recoup from what is going on in your life. So that is my digression for this episode. Hopefully we won’t have too many of those and let’s go ahead and get to the nitty-gritty of this episode. So I have a really fun guest for you today and in today’s episode, she is going to share with you how her parent’s regular Saturday money dates influenced her. Yes, her parents had a regular Saturday money date, it’s a good story and she’s also going to share what life lesson she learned from being a saver and it’s not what you would expect. She’s also going to share what a $800 hair appointment, yes you heard that right, an $800 hair appointment taught her about money and she’s going to share also how she has stayed sober from using credit cards and what she does instead. So let me share with you a little bit about Danetha. Danetha Doe is a business strategist and helps entrepreneurs understand accounting so they can honor their worth and live a life of purpose. She’s been selected as one of the top 40 under 40 accounting professionals by the CPA Practice Adviser. She’s also the author to the simple guide to accounting and financial strategy for new entrepreneurs. Danetha is also a former NFL cheerleader and loves to drink mimosas after she does her books. So let’s not delay anymore and let’s go ahead and meet Danetha. 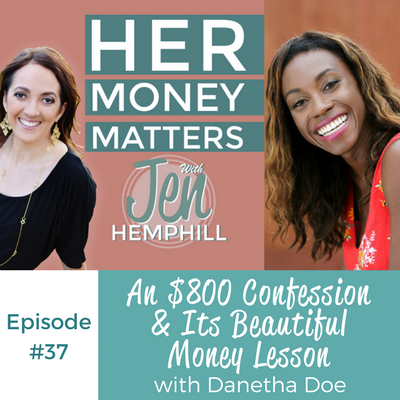 [0:03:54] JH: Welcome Danetha to the Her Money Matters Podcast. I’m really excited to have you here. [0:04:00] DD: Thanks so much Jen. I’m so excited to be here and thank you for the opportunity to connect with your community. [0:04:05] JH: Oh, no problem. Well, I’m really excited about getting to know you, your money story and getting to know you on the personal side and we know about you the professional, so we know you’re awesome, but I want to know more of you about your personal side. So more on a personal level, something that’s interesting about you. Tell us a little bit more about that. [0:04:31] DD: Sure, well like most people, we all have a very interesting money story. I grew up with parents that came from both sides of the spectrum. So my dad is more of the spender and loves to enjoy life. My mom is more of the saver which at times was great because they balance each other out but I definitely was exposed to just tension and arguments surrounding money and as an adult looking back on it, I could see that was possibly related to just their different outlooks on money on their relationship. Also, I grew up in a family where we were traditionally middle class which I like to say now just means you’re in between a rock and a hard place because you have too much money to usually qualify for certain programs but not enough to really make the ends meet. So I definitely was privy to struggles with money. [0:05:28] JH: Okay and so you mentioned your parents having the conversation or arguments around money, did they talk to you, have a money conversation with you from time to time, or tell me a little bit about that? [0:05:46] DD: Sure, yes. As a child, I grew up very aware about money and I’m not sure — I believe in a higher being and I’m not sure if that was just a part of me as a person but also just yes, my parents did expose me to some money. They would have regular dates usually Saturday mornings with their coffee and they would do budgets. [0:06:09] JH: Oh wow, good. [0:06:10] DD: Yeah, it was great. Looking back on it, I mean they would pull out the Excel spreadsheet or I also during the time before we really had a computer so they would pull out pen and paper and write it down and discuss where money is going to be going for that month. My mom is an avid coupon clipper so I would spend afternoons with her clipping coupons and really learned to appreciate the dollar and I knew when and which weeks are a double coupon weeks, which weeks were a triple coupon week. Yeah, for the most part, they were pretty open about money. They certainly tried to shelter us as children because they were really, really tight times and I feel that they didn’t really want to stress us out too much but you can always feel the tension. I definitely knew when rent is due or there were some Christmases where it was very clear where we wouldn’t get a lot of presents if any at all because times were just tight and my parents were generally pretty open about that with us, especially my mom. [0:07:13] JH: Okay, perfect. So you are exposed to the couponing, you saw and witnessed your parents just having those conversations and looking at their money and seeing where they were at. Now, you’re a bookkeeper but you’re also a business strategist but did that influenced you or how did you get into what you are doing now? I don’t know if your parents influenced that with your experience around money or was it something else? [0:07:44] DD: Yeah, that’s a great question. Something that I continually reflect upon as to why I am so passionate about my space. Definitely my upbringing has influenced me being an accountant and a business strategist. I also, growing up, I was a huge saver. I tended more towards my mom’s line of thinking that don’t spend money on frivolous things like massages or getting your nails done, save for a rainy day. And so as a young child, I would try to get as many odd jobs as I can. Whether that was babysitting or whatever, sometimes my parents would pay us to do chores and I would save my money and horde it because I felt safety in just having a piggy bank full of money. So as I grew older, I realized that I just had this idea that money was the answer to all your problems. I’ve just associated lack of money with tension and stress and I didn’t want to experience that. So my studies, when I went to undergraduate, I studied economics with the focus on finance and accounting. Not necessarily because I wanted to become an accountant, honestly I really thought that was kind of boring but I knew I want to be an entrepreneur. I knew from the moment I knew that you could own a business which was in elementary school that I started a nail company when I was eight. [0:09:11] JH: Oh my goodness. [0:09:12] DD: I had two clients, my mom and her friend and so I knew from a really young age, I always want to be a business owner. I never knew what that was but something told me that I needed to understand money in order to be successful in business and my dad also studied accounting and my mom as well, so I was exposed to that and decided to take that path while I was studying. [0:09:37] JH: Okay, so tell me about the challenges that you have around money. We all have those so tell me about yours. [0:09:45] DD: Definitely, happy to share. I love — I think it’s really important for us as women to be transparent about this because there are just so many things that we just don’t know because we aren’t comfortable sharing it with others. So I ended my last statement saying that I’ve studied accounting and started a business right after school doing something completely different from accounting. I started an apparel business for professional dancers. I’m a former cheerleader and went into that realm, thinking that I knew enough about accounting because hey, I had studied it in school. I knew theoretically what cash flow meant and how to budget, and then realized that it is very different to apply it practically than to think about it in theoretical terms and to have to deal with paying rent and student loans. And how to balance wanting to go out with friends even and all of those and the emotional side of money that we all have. And so with that experience, I have to close the business. I went through a period of homelessness where I really literary did not have money to pay for anything, student loans or otherwise. So from that experience, I learned that a lot of it has to do with the technical know-how, which I thought I was pretty good at and I was always open to learning more. But it’s also the relationship and the emotional side. I mentioned earlier, I’m a saver by nature and didn’t spend enough on self-care and realizing that money was there to support me as a person. It wasn’t just something to hold onto really tightly because you’ll end up losing it which I did. So my personal struggle has been and continuous to be balancing those two sides of me. I want to save money naturally but then I know that in order for me to feel fulfilled and to feel inspired to do business and to sell my services and connect with others, I have to support myself and not just rent and food but also getting a massage, getting my nails done, going out with girlfriends and that’s okay. That’s actually something that you should do, I feel. [0:12:09] JH: Right, right and I agree because a lot of women that I talk to and I’ve worked with have that guilt, because why? We’re naturally the nurturers, we take care of everybody else before we take care of ourselves. So if we go and do and get a massage, we feel that guilt. It’s interesting because you definitely brought up a good point and you’re not alone because I definitely have struggled. It’s gotten better but it’s something that I think that you have to continuously work on because I’ve always been naturally the saver, my husband the spender and I didn’t understand for a long time why I had that feeling, that I had to hold onto the money and it was related to my upbringing because there was always that lack mentality. And it might have been that there was actually a lack but it was also part of the mentality of my parents. So I felt like I had to keep that money and not spend it but I’ve learned overtime and my husband balances me out in that area but it is definitely something that you have to work on especially you and I that we struggle with this and many other women too. [0:13:26] DD: Definitely and I’m so glad you brought that up, the nurturer side because I, probably similarly to relate to you, I love spending money on other people. But there needs to be enough for myself at the end of the day too and that was something that I had to learn as well. It was to continually put myself first and it’s okay to do so. I feel that that guilt might always be there but overtime, it slowly diminishes. [0:13:55] JH: Right and it goes with like on a plane. You get on and they tell you when they go through the different directions of what you need to do in case of an emergency, you put the gas mask on you first so you can help others, your kids or people next to you and that’s the same, it’s basically the same thing. Take care of yourself and therefore, you are able to take care of others so much better. [0:14:20] DD: I love that analogy. [0:14:25] DD: Yeah, it’s so true. [0:14:26] JH: Yeah, it is and you know they bring that up but I always go back — each time I’m on a plane, I think about those things and other areas of life of how we definitely need to take care of ourselves because we are the best person and continuously take care of ourselves, I think we can do so much for others, so much more I should say, but that’s perfect. So best money spent, tell me about that? [0:14:57] DD: Oh, my best money spent. Okay, so it’s a tie between two. I’ll start with the first one if that’s okay? [0:15:05] JH: Okay. Sure, absolutely. [0:15:06] DD: I had moved to the Grand Canyon. This was the time right after I had started my business, completely ran out of cash, needed to find a job and I found a job on Funjobs.com. [0:15:20] JH: I’m not familiar with that. [0:15:23] DD: I wasn’t either. Until I — I don’t know how I found it. Divine intervention, I’ll just throw it up to that and I stumbled across this job in the Grand Canyon on the north rim which is the side of the Grand Canyon that’s closed during the winter because they actually get snow and it was a hostess job at a restaurant. It was eight bucks an hour. I was like, “Oh my goodness, I have a degree. I’m going to get paid $8 an hour, I have student loans, what?” And I took it because there was nothing else and it was also during the ‘08 financial crisis and there literary wasn’t a lot of options and so I moved there and I got there six to eight weeks before the canyon closed and towards the last week, the last week that I was there, there was a shop right there in the canyon. It was this beautiful jewelry shop that catered towards tourist and the jewelry was really expensive, at least to me it was and I walked in there and I think I had $600 bucks in my account. I walked in and there as this gorgeous, gorgeous ring. It was an emerald with — I am wearing it now. An emerald piece and it was made by the Navaho Indians and I looked at it and it was $320. I said, “Oh my goodness, that’s half of what I have in my bank account right now but this ring is so gorgeous.” I’m not one to spend money on jewelry and I don’t know why this ring spoke to me and I purchased it and that was six or seven years ago. I still have the ring and after that purchase, it was a great decision because I love the piece of jewelry and also it showed me that I can spend a lot of money, whatever a lot of money means to me at the time, and still be okay. I wasn’t struggling after that purchase because that was something that I was concerned about. I didn’t know how I was going to pay my bills, an opportunity magically appeared that covered my upcoming expenses and that purchase solidified me that if I just listen to what I want in the moment and I’m truly okay with that decision, whether it’s a purchase decision or another decision, that everything will work out. [0:17:46] JH: Oh, I like that. I like that because sometimes — yeah I agree. It’s just a matter of opening yourself up and that mindset. It’s working on your mindset is what it is where you’re opening up to a world of abundance. So that is beautiful and you have a second one too? [0:18:06] DD: Oh yes, there was a second one. It was my second year in business and I was making more money than I was at that time but still not a lot. Again, back to that lack mentality. Sometimes, at least for myself, it feels like I never feel like I’m making enough money and that’s definitely a part of my relationship with money is feeling that sense of abundance. So I was in my second year of business, making more money considerably than I was before but not enough to me and I really wanted to get my hair done and I was like, “Oh I want these gorgeous highlights, I want to get extensions,” and I sought out this stylist that was in my town and in the Bay Area and she quoted me a price of $800 for that one sitting. It was a four to five hour hair appointment and $800. [0:18:56] JH: Oh wow. Wow! [0:18:57] DD: Right! The most money I have ever spent on anything. Probably not anything no, but at least on my personal self-care and I went ahead and spent the money. I felt so glamorous afterwards. I mean if nothing happened afterwards just the fact that I could look at myself in the mirror and just really love what I looked like, it was one of the best purchases. And again, after that an opportunity came about related to my business. I signed a client, one of my highest paying clients still to date and I would like to say it’s because of my hair and the way that I felt about the way that I looked. [0:19:39] JH: Did you find this client in person or was this online? [0:19:44] DD: Surprisingly, this was in person, someone in my community and yeah, you know it’s the hair, it’s the confidence, whatever it is but totally, it was. [0:19:54] JH: Yeah because I was going to laugh if it was online. That was like is she joking around that’s why I had to ask. [0:20:08]JH: “And the confidence that I carried, it was the hair.” I love that, those are some good stories and I like that basically it’s all about the mentality and your mindset. It has so much to do and that’s where for my philosophy and coaching and educating women is teaching the mindset because you can have this great mindset but no skill set and you’re not going to go anywhere. But at the same time you can’t have just the skill set and a bad mindset. You got to have the two and that’s definitely something that I work on when I teach. So tell me, I’m really curious about this question and having with your background as an accountant but for your personal finances, do you use a spreadsheet, some sort of software, an app or are you just of a traditional person with piece of paper and pencil? [0:21:12] DD: That’s a great question. So I definitely lean towards apps because I like to move around a lot, I love my phone, everything’s on my phone. It makes it really easy for me to track if it’s on my app. With that said though, I’m definitely, I’m a writer as well. I like to do a lot of creative writing just for myself. That pen to paper sensation is really important for me. [0:21:58]JH: Okay, a combination of the two. [0:22:01]JH: Perfect. How about do you use more cash, credit, check? Credit card? What’s your preference? [0:22:12] DD: I like how you chuckled after the check. How do you feel about checks? Because I would like them eliminated. Now they’ve eliminated the fee I guess other people felt the same way but this time is for the house keeper. That’s where I use the check because I will never — not I will never, I hardly ever remember to go to the ATM to take the cash out. So check is just so much easier. [0:22:59] DD: Totally, makes sense. Yes. [0:23:02]JH: That’s it pretty much. [0:23:04] DD: Yeah, you know it will be interesting to see where checks are in like five to 10 years. I am definitely a debit card person. I’ve gone off, I’ve been — I say “sober” from credit cards for six months now and I’m really excited about that. I’m definitely debit card person because I like to review my transactions either — I have a weekly bookkeeping date or money date. I like to be able to track them electronically. Cash, I’m not good with cash. Cash burns a hole in my pocket, I don’t know wherever it goes. I do keep some on me because there are times when you need cash but I have given up on trying to make myself good with cash. I just spend it. It’s a debit card for me. [0:23:54]JH: Awesome. It sounded like you used to use credit cards but you’re staying away from it, it’s just personal preference or did you say you were spending more easily with the credit card, what changed? [0:24:09] DD: Totally. Yes, I used to, I just saw myself spending more. From a personal standpoint, not even related some money. I’m trying, also relates money. I’m really trying to work on me being present and that’s in all areas of my life. That’s just a reflection of me for myself, definitely different for other people, for myself I found it was me not being present. By using my credit card and allowing myself to pay it off three, six, 12 months later and still thinking about that purchase that I made before, it just wasn’t a good practice for me. So yeah, I’ve just eliminated it so that now when I do spend money I know okay, I’m spending money that I have now and I won’t ever have to think about or regret this purchase later. [0:24:56] JH: Right. I hear you and everybody is so doing there because others like to use the credit cards for the planes, using that to travel, that type of thing. Everybody’s so different and then you just have to find the system that works for you and that’s perfectly fine. How about, you mentioned your phone, the love for your phone, what is your favorite money related app? [0:26:05]JH: Oh okay. I haven’t heard of that. [0:26:05] DD: Yeah. I would check it out, it’s free and it links everything. Not only your bank and credit cards if you have credit cards, all those transactions but also your investments. Like your 401(k) you can link your student loans, your mortgage payments, it’s all in one place. So it calculates your net worth at any given time for you, it’s pretty cool. [0:26:31]JH: I’ll have to definitely look it up. I’ll make sure I put the Xero — I’ll look up the Xero app and put it in the show notes as well as Personal Capital as well. I’ll make sure to get that in the links of the show notes and how about favorite money guru celebrity? [0:26:49] DD: My favorite money guru celebrity. Definitely Suze Orman. She is incredible. I have the opportunity to interview her in a really short interview. [0:27:02]JH: Awesome, I’ll have to check that out. [0:27:05] DD: Yeah, please do. Again, my time with her was really short but it was like everything to me. It was Huffington Post Live. And she’s just incredible. I think she’s also from the Bay Area. I started a book keeping company when I first moved here called Emery Cloud and it was in reference to her living here in Emeryville where she got her start as the finance guru that she is now. She’s great, she was the first person that really exposed me to the emotional side of money and how that is so important when you’re trying to create the financial future of your dreams. [0:27:46] JH: Right. Yeah, my first exposure to personal finance as far as books was one of Suze Orman’s books. I can’t remember which one, I can picture the cover but that’s really the first book I read on personal finance is one of her books. So that’s interesting you bring her up. How about book, what’s your favorite money book? [0:28:10] DD: Oh this is such a great question. To be honest, I’ve read a lot of Suze Orman’s books and I love them all, I’ve read a lot of money books. The one that’s made the most impact on me is not money related, it’s Return to Love by Marianne Williamson. [0:28:29] DD: That, it’s not directly related to money, however when I read it, I was in a period of my life when I was trying to figure out my money situation and it taught me the importance of self-love, self-forgiveness and for me it was related to my money choices, my relationship with money and using it as a form of self-care and putting myself first. So it was so pivotal in just helping me reevaluate how I viewed money, and that money isn’t the end all, be all, that’s also one of the things that I work with. Because I am in the money world similar to you Jen and I don’t know if this is the same for you but sometimes I find that, I forget that there are other pleasures to life besides money. [0:29:20] JH: Right, right. Absolutely. [0:29:21] DD: Yeah, that book helped me realize that I’m a little obsessed with money sometimes. [0:29:27] JH: Well what is the title of the book? I know Marianne Williamson is the author. [0:29:32] DD: Return to Love. [0:29:34] JH: Okay, I’ll make sure to link that up because I haven’t read that one. Okay, perfect. Thank you for sharing that. This has been fun Danetha, and you know that this podcast is all about making money simple and taking control of it. How would you finish this sentence? Her money matters because _____. [0:29:58] DD: Her money matters because money allows you to live your most fulfilled and embodied life. [0:30:08] JH: Perfect, I love that. So I really appreciate you being here with us Danetha. Can you tell us where is the best place for people to find you and learn more about you? [0:30:21] DD: Thank you so much Jen for the opportunity, this has been a lot of fun. You can find me, I’m all over the interwebs. I love social media, so the best place is my website Danethadoe.com. [0:30:37] DD: Or if you're a Twitter person, @danethadoe. [0:30:41] JH: Twitter and your website. Perfect. Well I’ll be sure to link that up in the show notes. So again, thanks so much for joining me Danetha and I will make sure we connect again. [0:30:54] DD: Awesome. Thanks so much Jen and I’m looking forward to connecting again. [0:31:00] JH: Well that was definitely a fresh perspective, a different perspective and I hope that you enjoyed listening to the interview as much as I enjoyed chatting with Danetha. Now, I want to highlight just real quickly a review that we got recently. I haven’t done that in a while. If you’ve been listening to this for a while and you haven’t left a review, I would love your support in that because basically that just gets this podcast in the ears of more people. [0:32:07] JH: Hillary, I really appreciate those kind words especially as a fellow podcaster as well as a woman that we’re doing the similar things. I really appreciate your kind words. Now, let’s get back to this episode because I wanted to touch base on something and dig a little deeper. There was a point in the interview with Danetha that she mentioned, her $800 hair appointment and how it was a great experience and shortly after that, she got her highest paying client to date as of the day of the interview. You probably either had one or two thoughts. One, “Yay, that’s just awesome,” or B, “Who in their right mind would pay $800 for a hair appointment? I would rather take the money, [insert whatever you would do with it],” right? Am I right? You either have one of those two thoughts. Let’s be real and let’s dig a little deeper. If you’re feeling the icky feeling, if you’ve felt that. When you heard that she spent $800 on a hair appointment. So hear me out okay? There are three key words that I like you to keep in mind. Those three key words are abundance, priorities, and permission. So let’s talk about abundance first and really, the definition of abundance is simply a large quantity, plenty. Just basically plenty of anything. 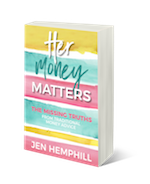 So if you’re struggling with or if we’re struggling with our money, we’re struggling with a part of what we’re struggling is a scarcity mindset where we tend to have a lot of thoughts of not having enough. Which does not let thoughts of abundance meaning that we have plenty, enter a realm, enter our world. I really truly believe there our mindset, in other words, the thoughts that we feed ourselves is really such a huge component with your success, with your finances. I don’t think that you can be a great saver and great at your budget and not be great with your mindset or meaning having these negative thoughts all the time, it just won’t happen. On the other hand, you can have those great mindset of everything’s great, we have plenty of money but you’re not a good saver, you don’t manage your money well, you can’t have one other. I really truly believe that you have to do both well. So let’s think of Danetha’s story and she spoke at that moment of how her business was doing okay. I think she mentioned something to the extent, it wasn’t as good by her standards but she was okay with it right? Notice throughout our interview, when she spoke, she had this abundant mentality overall right? She had this mentality of everything was plentiful, right? This really, if you think about it, allowed her to make the decision of scheduling this high end hair appointment. She didn’t have these feelings of, “I can afford it.” Yes, maybe there was some fear a little bit but she moved forth because she had the confidence and then she got a high paying client after that, right? Now, I’m not saying go spend a bunch of money and you’ll make more money. That’s not what I’m saying. What I’m saying is that having these thoughts of abundance have an impact on your personal finance, it raises your confidence level which helps you make better decisions with your money. Also, another thing to note, a big part of it is being grateful for that penny, for that dollar, for that euro, whatever your currency is. No matter the amount. If you’re not able to be grateful for even those small amounts, I’m going to keep it real with you that is scarcity talking. So you want to turn that around and you can easily do that by being grateful, expressing gratitude for that amount of money that you have, no matter how much it is. So I definitely recommend, I definitely encourage you to take some time to be grateful for that money that you have, which in turn raises your thoughts to be more abundant and pushes the scarcity thoughts aside and therefore, that confidence level will soar. The second key word here is priorities. You need to be clear on your priorities. Maybe for you it’s those family trips like for me it is. Maybe it’s a certain hobby that you may have. For Danetha, those things, hair appointment and Jewelry, those are priorities for her. What I don’t want you to do is get stuck on saving more money, paying off debt, that’s all great but your priority is beyond that. The priority is the things that you enjoy doing, whether it’s that hobby, maybe it’s a photography hobby, maybe a family trip. Whatever the case may be, you want to be clear on those priorities. Obviously saving more and getting out of debt will help funnel those priorities or fund those priorities but I don’t want you to get stuck in thinking the priorities are saving money and getting out of debt. I want you to think beyond that. Also, I want you to consider that whatever your priority may look like, maybe to some the cost of it may seem a lot to others and I want you to remember that what others think about that is irrelevance. Especially when they’re not contributing to your personal finance. Now, of course if the other maybe person may be your spouse, what I suggest to just mediate that or to lessen that, is to for both of you to have a separate spending account, where it’s no questions asked, whatever money is in there, you spend it on however you want to spend with no questions asked, okay? The third keyword is permission. You need to give yourself permission to splurge. Money is a tool, it is here for the reason is to help you live that fulfilled life. Your money really wants to help you do that. You just have to let it by feeding yourself with thoughts of abundance, by knowing really getting clear on what your priorities are, by giving yourself permission and of course, doing the physical stuff of managing your money. If you need support, if any of these are areas that you need support in, that you need guidance, that you need accountability to make this a happen, I encourage you to test out our fearless money sisterhood membership program. Test it out just for a month, it will only cost you $1, one US dollar, and after that it’s $25, that is it. 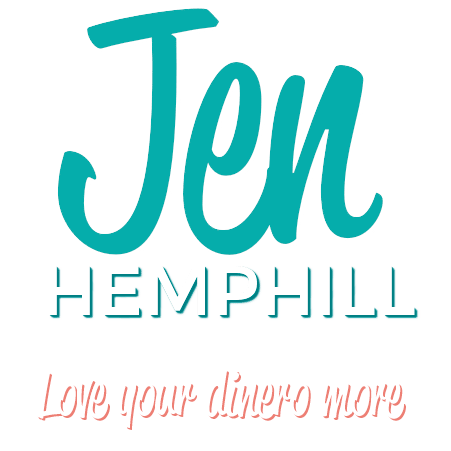 You can get all the details at jenhemphill.com/dollar. We have a lot of fun, we have monthly calls, we have a Facebook group, I do trainings, special classes. It’s a great program, it’s a no brainer program especially if you’re needing that support. So I definitely encourage you to check it out especially for $1 for a full month. That is it. That is a wrap for today, I want to thank Danetha for joining us, for sharing her story, definitely gained a lot from it. Be sure you can check out the show notes where you can find the links on where to find Danetha, the resources that we mentioned and more at Jenhemphill.com/37. Thanks again for joining us today and I’ll talk to you and catch you next Thursday.